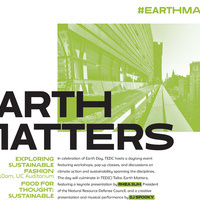 In celebration of Earth Day 2015, The New School’s Tishman Environment and Design Center (TEDC) hosts Earth Matters: Designing our Future, a daylong event featuring workshops, pop up classes, and discussions on climate action and sustainability spanning the disciplines. Culminating in a keynote presentation by Rhea Suh, President of the Natural Resources Defense Council, and a creative presentation and musical performance by DJ Spooky, the event highlights TEDC’s bold integration of design, policy, and social justice approaches to environmental issues. Forty-five years ago Parsons and New School students celebrated the first Earth Day in Union Square Park. Since then the ripping open of the Earth to extract 'resources' has increased, destroying the Earth's living systems. Which Primal Element has chosen you? Come visit our Dome of Memory in The University Center Lobby to tell your stories of encounters with the Primal Elements -- Water, Fire, Earth, Air, and Space. Students: Miranda Aponte, Jillian Blakey, Jack Dinning, William Eatough, Florencia Garcia de Onrubia, Antonietta Gianfrancesco, and Mateusz Pastula. Join us for four short presentations about sustainable food systems. A tasty, sustainably-source meal will be served to attendees. --The Carbon Foodprint: How The New School is Reducing its Impact, led by Ed Verdi, New School Senior Director of Business Operations. The 6 p.m. event only will also be livestreamed here. To highlight Tishman Environment and Design Center (TEDC)’s bold integration of design, policy, and social justice approaches to environmental issues, this special evening event will feature a keynote presentation by Rhea Suh, President of the Natural Resource Defense Council and a creative presentation and performance by DJ Spooky, 2014 National Geographic Emerging Explorer. This event is free and open to the public, but RSVP is required at the top right button.